Discovery Bank hits the market this week with 50 000 people who have signed up requesting to become customers. It's a clicks not a bricks bank as it will exist largely on its phone app (banking application) and it will not have any other than a few demonstration branches. Roughly 2000 of the initial enthusiasts will be signed up in the first month, with “tens of thousands more” by June, said Discovery CEO Adrian Gore who pressed the starter gun on the new bank in Johannesburg on Monday. The bank is coming to market slowly and carefully, says Gore, who has taken some investment analyst flak for big spending on new parts of the Discovery empire at the cost of higher profits and dividend payments. Citi, a global financial multinational, has lowered its expectations of the Discovery share price as a result of its expansion into new areas, according to a Business Times report on Sunday. Fees are set competitively but are not the lowest in the market; neither are interest rates the highest – instead, Discovery will compete most fulsomely on rewards and incentives to customers who manage their money well. Monthly fees go from R150 to R440 depending on the account type, according to early documents. 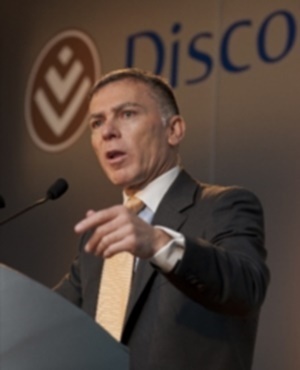 READ: Ferial Haffajee: Can Adrian Gore disrupt the banks this time? The new bank will pay or charge “dynamic interest rates – where you earn on savings accounts goes up and rates on borrowings come down,” based on your financial health status. Discovery Bank CEO Barry Hore says “lazy balances” in transaction or credit card accounts often do not attract interest payments. Here, Discovery Bank will go toe-to-toe with Capitec by offering from 5%-5.5% on a positive balance. This is higher than the median. “The incentives and rewards are multiples higher,” says Gore. The bank will offer transactional and credit-card facilities across several product offerings – from a blue card to a purple high-end card of which only about 200 will be available to the super-rich. Your status, though, will not only be based on income, but on how healthy your finances are. Based on factors including how well you save for emergencies and for retirement; how well you budget and on your credit score, customers will be awarded a second ranking. Discovery Bank’s national ambition is to get South Africans to manage money better. “South Africa’s net household savings rate, at 0.3% of household disposable income, ranks well below many other OECD counties,” says Discovery. Its own research has found that there is a 58% life insurance gap among middle to upper income South Africans; that 65% of cars on the road are not insured and that 32% of middle and upper-income South Africans do not have medical scheme cover. Discovery Bank is the second to come to market without branches: Patrice Motsepe’s TYME (Take your Money Everywhere) is also run only on digital and on customer points run in partnership with Pick ‘n Pay. The Discovery Bank will not have many of its own ATM’s either as it gambles with the notion that cash is going out of fashion and it wants to encourage the trend. The incentives or rewards offered are similar to those offered to Discovery Vitality members who achieve fitness statuses from blue to diamond. They include hefty discounts on travel, entertainment and on retail, including food. FNB has hit back at Discovery’s claim to be South Africa’s first behavioural bank which rewards for good financial behaviour. The industry leader has recently put out numerous think-pieces to stake its claim as the lead investor in fintech (financial technology) innovation with its banking app being a highly popular instrument across its market. But Discovery is different in that it does not only incentivise for internal product use; it will award incentives if you can show savings products from other companies too. FNB, like others, only rewards as you expand use of the company’s related product offerings. If you are a Discovery member, your bank account will be linked to your health plan: you can, for example, allow for automatic co-payments to doctors, specialists and at pharmacies. Other than the 50 000 enthusiasts who requested to become members, Discovery is likely to targets 200 000 Gold and Diamond Vitality members who are super-users. The new bank will also enable family banking where a primary account holder can grant cards, cash and credit access to his or her family. Gore showed how this worked using his own family account where each member has their own facility within the family bank account. It has geo-location abilities which means that parents can, for example, can block access to certain retail outlets they don’t want their kids to shop at.